I find this story really sad. My heart hurts for Evan and the struggles he faces and the situations he gets himself into. 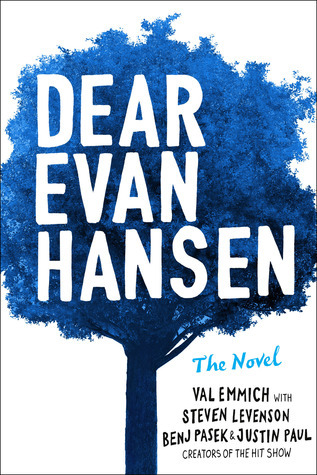 Reading the book was more emotional than the musical because the novel format allows you to delve further into Evan’s brain and really expand on the emotions and issues he experiences. This also makes the book far heavier than the musical as there are no lighthearted catchy tunes to raise the mood. With no light relief the book is a really intense reading experience which is incredibly immersive. The author’s writing is captivating and very believable. I imagine it was extremely hard to write this story without making it sound preachy- how can Evan learn his lesson without making it sound like a cheesy cautionary tale? The authors managed to tell the story with compassion and through it all Evan remains a sympathetic, lovable character. I recommend curling up with this book with the soundtrack on in the background. You can never have too much Dear Evan Hansen! I was provided an e-ARC of this book via Netgalley in return for an honest review. I’m not sure what I expected before I picked up this book but whatever I thought I was going to get, this wasn’t it. From the beginning of the book I felt like I was wrong-footed and that feeling didn’t really go away until I read the last page. The Truth and Lies of Ella Black follows a teenage girl with a dark secret as her parents one day whisk her away on a supposed holiday of a lifetime in an attempt to keep their own dark secret hidden. It’s actually very hard to discuss the plot of this book without spoilers as so much of the story revolved around the unknown, with secrets slowly being revealed to the reader as the plot progresses. What I will say is I found something lacking with this book. On the surface the plot is gripping but the reading experience didn’t quite match up to the expectation I had for this book. I badly wanted the pace to pick up but I found myself almost becoming bored in between sections where secrets were being revealed and action was happening. None of the characters were likeable, which I feel could have been purposeful, but more than that they often didn’t seem like realistic people. Their speech and behaviour wasn’t fully fleshed out and I didn’t feel any kind of strong connection to them at all which always lessens my enjoyment of a book. If I’m not going to like a character, I at least want to dislike them. Feeling nothing about them leaves me disinterested. My biggest issue with the book is Ella’s love interest plot. It seemed so unbelievable that she would meet her dream boy in the way she did and have him fall head over heels in love with her without so much as a word being uttered that I kept expecting him to be part of the bigger storyline. I was hoping he would turn out to not be as he seemed and have more sinister intentions. In the end, I felt his inclusion in the story just served to pad out the plot and lengthen the book unnecessarily. Although my review may seem largely negative I have to say that I did read this book very quickly and found that I didn’t want to put it down. I did want to get to the climax and find out what was going to happen and overall I was satisfied with the ending. I do think it would have benefitted from developing the characters somewhat more, and focusing less on describing Ella running around Rio and hiding from everyone and more on her discovering the details of her parent’s secret as that was the part of the plot that was really gripping. I think I would recommend this book to friends in the future, for the fact that the unfolding mystery is so original and it is a compelling depiction of mental health problems but my recommendation would come with caveats. 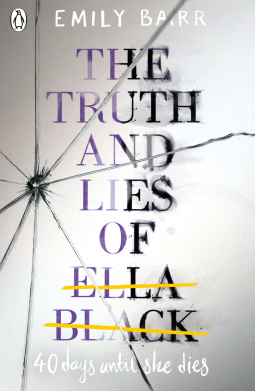 The Truth and Lies of Ella Black is published 11th January 2018. Rosemary and Fern were inseparable growing up, revelling in growing and learning together and soaking up as much attention as possible from their family and anyone who visited their home, including their father’s graduate research students. That is, until the day Fern vanishes from family life turning Rosemary from a bright, talkative child into a confused young woman desperately seeking answers to the disappearance of her sister and the reason for her older brother running away. 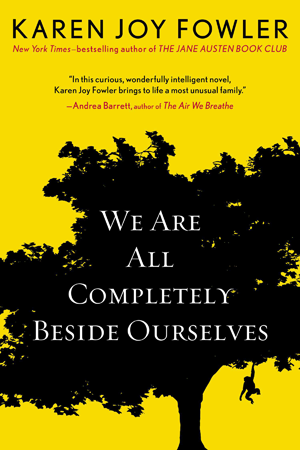 Karen Joy Fowler’s arguably most successful novel The Jane Austen Book Club is a book I absolutely adore so I had very high hopes for We are all completely beside ourselves. Although the plot couldn’t be more different, the writing is as beautiful and packed with emotion whilst being fiercely intelligent with enormous depth. Karen Joy Fowler really knows how to take the reader and make them empathise wholly with her characters. At points, I was so immersed in the story I forgot I was reading a novel, it honestly could have been a true life childhood memoir. My copy of this book came with a note advising me to tweet my reaction when I reached page 77 which intrigued me and I have to say, I did not guess the big plot reveal in the slightest (which dented my ego somewhat as somebody who studied this kind of thing at university!). Suffice to say, what starts as a normal family memoir ends as something entirely different and is one of the most original plots I have had the pleasure of reading in years. I can’t remember ever reading a novel which has so easily balanced humour and important moral issues in the way Karen Joy Fowler has here. I found myself thinking about the subject of this novel in between reading sessions in more depth than I ever would have before outside of my degree. I cried and laughed my way through this book and fell in love with Rosemary and Fern to the extent that I was sad when I reached the end. It really is one of the most beautiful novels I’ve read in a long time and I have no doubt I will be giving copies to my friends and families for many Birthdays and Christmasses to come. This review was first published on Nudge-books.com and Goodreads on 8th May 2014. Young bohemian artists Harry and Robin are a young married couple living in Tangier with their young son Dillon when their lives are devastated by an earthquake. Left alone in their flat whilst Harry popped to a neighbour, Dillon appears to vanish without a trace and is assumed dead. After losing their son Harry and Robin relocate back to their home city of Dublin in an attempt to rebuild their marriage and move on from the tragedy, a feat easier said than done considering the great resentment Robin feels towards Harry for leaving Dillon unsupervised, and the existing problems that dominated their marriage even before the earthquake. The main story picks up five years after the loss of Dillon. Their relationship is still fragile, but Robin is hopeful for their future, and so is Harry, until he sees a boy in a crowded Dublin street. A boy he recognises immediately as his missing son. 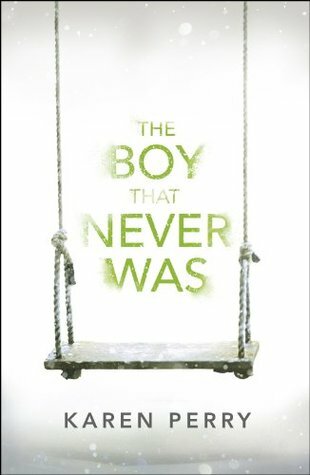 The Boy that Never Was is being compared to the kinds of psychological suspense novels written by leading authors such as Nicci French, Sophie Hannah and Gillian Flynn. With this in mind, I sat down to read with high expectations. These expectations were met in some aspects- the plot of the book is very fast paced and exciting, with twists that definitely rival Gillian Flynn’s Gone Girl. However, I did initially have trouble getting into the flow of the writing. The narrative is told from the point of view of both Harry and Robin, in alternating chapters. This in itself doesn’t usually present a problem for me, however, I found Harry’s chapters very dry and often boring which was disappointing considering a lot of the main plot happens directly with his involvement, and therefore during his chapters. At times, I felt I only continued reading because of the strength of the plot, and because I found Robin’s chapters much more engaging. With psychological suspense novels authors have to balance a fine line between being enigmatically mysterious, and being downright confusing. I found the first 50 pages of this novel sometimes wobbled over into the latter a bit too often. I have wondered whether this disjointedness I experienced was the result of the book being a product of two authors, rather than one (Karen Perry is the pen name of respected authors Karen Gillece and Paul Perry). I’m always intrigued when I hear of author teams like this, and fascinated to know how it works. I don’t know how they wrote this book, but I did at times get a sense of two distinct writing styles fighting against each other, rather than working to complement each other. In spite of this minor issue with getting into the flow of the story, once the plot picked up pace I couldn’t put the book down. I thought I had it all figured out by half way through the story, but then everything changed and I was completely blind sided. I was gripped right to the end because I couldn’t believe what I was reading. I really dislike it when authors think up a very clever and intricate plot and then leave a lot of loose ends for the reader to assume their own ending, and this story did the complete opposite of that. I was left feeling very satisfied that the plot made sense, the actions of the characters all made sense and the story was rounded off nicely. I urge you to do what I did with this book- curl up with a cup of tea and read it in one sitting. Allow yourself to be absorbed in the drama and then take days to get it out of your thoughts. This review was first published on Nudge-books.com and Goodreads on 5th March 2014. Leila has lived a sheltered life, centred around an unhealthy co-dependent relationship with her mother. After her mother dies, she is left alone, completely unequipped to be in charge of her life. She soon finds comfort in spending as much time online as possible, first in role playing games, and then in forums chatting to like minded people. It is through a forum she is hand-picked and groomed to be the perfect person to take on the virtual identity of Tess, who wants nothing more than to disappear without causing alarm to her family and friends. Naive Leila is only too happy to help, and soon finds herself in way over her head. I found the premise of this book really interesting so I was very much looking forward to reading it. However, as interesting as the plot seemed, I was left largely dissatisfied on finishing the story. I spent a lot of the story waiting for it to really kick start, and it never really did. I found Leila as a character very confusing. It’s never explained in the book why she is the way she is- whether he has some kind of autism, a learning disability or whether she is simply a product of her mother’s over protection. Without this information I found it tricky to know how I should be feeling about her, and her actions. On the other hand, Tess was a character who was described in so much detail one would assume she would appear to the reader larger than life. Unfortunately, I just found her unrealistic, and unbelievable. I know quite a bit about mental health, and depression, and the portrayal of Tess just didn’t support the plot of the story for me. I had no problem finishing the story, it moved along at a good pace and I was interested to know what happened, however I think if I’d have read this book in separate sittings rather than all in one go I might have struggled to maintain my interest. I was also waiting for there to be a twist at the end, but the story played itself out as the reader would expect. There were no great surprises, for me at least, and the ambiguity of parts of the story which never got finally addressed along with the superfluous nature of some of the characters we are introduced to left me a tad disappointed. 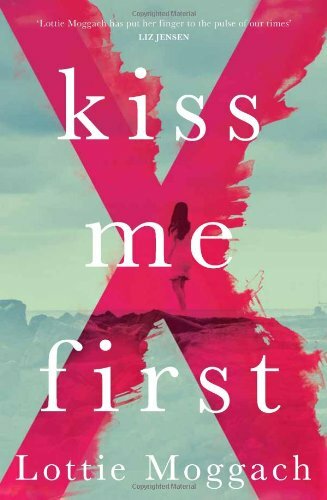 Kiss Me First is a fine story, but if you’re looking for a thrilling psychological suspense novel this will probably not be your best choice. This review was first published on Nudge-books.com and Goodreads on 4th March 2014. Jan is a loner with a dark past full of secrets. A nursery teacher by occupation, he answers an advert in the newspaper for a job at a nursery with a difference. Attached by an underground passage to St Patricia’s psychiatric hospital, Dell nursery is a pre-school for the inmates children designed to allow them to keep in regular contact with their incarcerated parents. Staff at the nursery are forbidden from entering St Patricia’s, asking questions about the inmates, or enquiring with the children about their visits but Jan has heard many stories about the inhabitants of the hospital and as he sends each child off on their journey through the passage he becomes single minded in his goal to enter the hospital… and he isn’t the only one. As he gets closer towards succeeding in his mission Jan’s dark past comes back to haunt him. What happened to the boy who went missing in his care nine years previously? What is his connection the inmate he’s trying to get to, and how far is he willing to go to find a way to contact her? 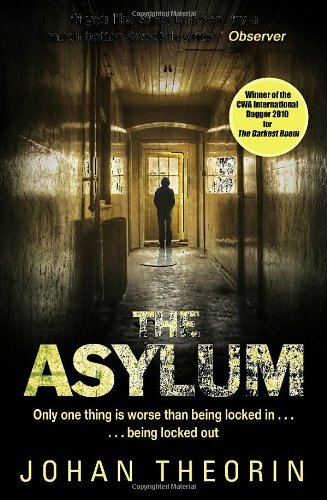 When I first read the blurb for “The Asylum” I was really excited to read it. The premise of the story seemed to balance psychological mystery with crime well, and over the past few years I’ve grown a strong penchant for any books which can be described as “chilling Swedish psychological crime” fiction. Unfortunately, I was largely disappointed with the book. My biggest issue is with the translation, I think. You can usually tell when a book is written badly, or if it just hasn’t translated well and I definitely feel it’s the latter with this book. The prose didn’t flow well and I found it very hard to get absorbed into the story because of this. The plot line really relies on the reader being completely hooked from the start – the characters are all hiding deep dark secrets and they’re drip fed to the reader slowly and steadily meaning that the reader has to have a lot of patience to wait for the answers to the mysteries they’re being presented with. I didn’t hate reading the book, or dread picking it up, but neither was I finding any excuse in my day to pick it up and find out what was going to happen next. My enjoyment of the story definitely suffered because of this. Additionally, the story of the missing child from Jan’s past made me feel very uncomfortable and not in an enjoyable edge-of-my-seat kind of way, in an I-really-don’t-want-to-read-this-if-it-continues-in-this-vein kind of way! Another aspect of the book I had difficulty with was the flatness of the characters. Jan really gave me the creeps to begin with but then he just levelled out into a nothing character. I didn’t like or dislike any of the characters. I simply didn’t care about any of them, even the children, and when I don’t feel any kind of emotion for the characters I’m reading about I’m only ever going to be able to enjoy a book to a certain level. The plot of the story was interesting, but on the whole I was disappointed with my experience and I don’t feel like the blurb accurately provides readers with an idea of what it is going to be about. This review was first published on Nudge-books.com and Goodreads on 19th June 2013. Eight years ago Gen Loxley gave birth to a stillborn daughter, Beth. Since then she’s found it impossible to move on, floundering whilst her charismatic husband, Art, flourishes. Then, one day a stranger arrives at her door with news she could only dream of- Beth is alive. Initially distrustful of this stranger, Gen quickly finds herself sucked into a sinkhole of unanswered questions and suspicious behaviour. Why is her best friend Hen having secret conversations with Art, why can she not find anybody who was present at the stillbirth to corroborate that her baby was dead on delivery, who was Art transferring money to just a few days after the birth? In her first adult novel Sophie McKenzie weaves a tale full of confusion and doubt which keeps the reader guessing to the very end. Gen is portrayed as a very sensitive and vulnerable person and this makes her whole narrative uncertain. Should the reader be on her side, or is she suffering from paranoid delusions caused by her grief? The underlying tension between Gen and Art, and indeed Gen and most of her family and friends means the reader is constantly switching sides. Every new piece of information that is uncovered is marred by the unreliable perceptions of the characters. You find yourself certain that you know what is coming next, only to question the source of the information that led you to this assumption. The child’s narrative that intersperses throughout the story remains a mystery to the end of the story. I found myself getting sucked into the story and every time I had decided that Gen was paranoid I’d reach another page written from this mystery child’s point of view and be completely thrown off the scent again. Ultimately I did guess the ending of the novel, whether this was because I am particularly good at sleuthing or because I had a lucky guess I don’t know! However, guessing the ending didn’t spoil my enjoyment of the story at all. At times I was wriggling in my chair, so eager was I to reach an explanation. Even when the answers do start arriving they are drip fed to the reader and this infuriated me and delighted me in equal measure! I did find a few red herring plots a little bland, but then novels such as this need many different possible avenues in order to avoid the real ending being guessed. Additionally, I found that the end dragged on a little too long for my liking and some of the action could have been cut out and tidied up to keep to the climatic pace I felt I had been built up for. Finally, the last page of this book was possibly one of the most chilling things I have ever read. 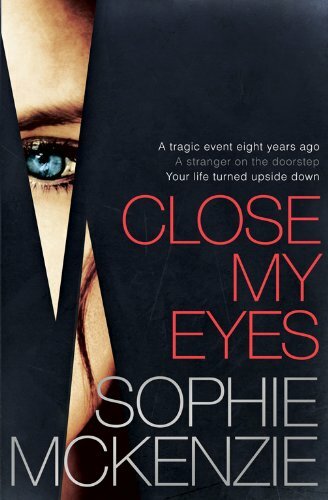 If you’re one of those people who like to sneak a peek at the end books before they start reading- do not do it with Close my Eyes. The ending is worth waiting for! This review first appeared on Nudge-books.com and Goodreads 24th April 2017.